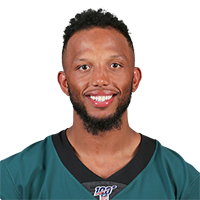 Johnson signed a one-year contract with the Eagles on Tuesday, Dave Zangaro of NBC Sports Philadelphia reports. The AAF announced Thursday that all players, including Johnson, are immediately authorized to sign with NFL teams. Analysis: Johnson was arguably the most impressive receiver in the AAF this season not named Rashad Ross, and the 30-year-old ultimately finished the year with a league-leading 45 receptions and 687 receiving yards over eight games. He should be an option for any team in need of veteran depth at wide receiver, especially since Johnson has already shown potential in the NFL ranks thanks to his 2014 season with Minnesota when Johnson caught 31 passes for 475 yards and two scores. Johnson leads the Alliance of American Football in receptions (11) and receiving yards (252) through two weeks. 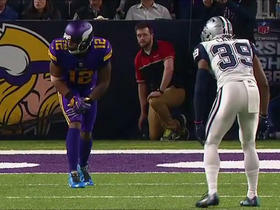 Analysis: Johnson is one of the bigger names in the AAF -- a 2013 seventh-round pick of the Packers who posted a 31-475-2 receiving line for the Vikings in 2014. He bounced around the NFL after playing 39 games for Minnesota from 2014 to 2016, most recently getting cut by the Jets at the end of the 2018 preseason. Johnson will turn 30 at the end of February, but he apparently still has enough juice to get another look from the NFL, assuming he makes it through the AAF campaign without any major injuries. Johnson was waived by the Jets on Friday, Manish Mehta of the New York Daily News reports. Analysis: Johnson, a training camp standout who nabbed Sam Darnold's first pro touchdown, has nonetheless failed to stick with the team. The 29-year-old will attempt to catch on elsewhere around the league as a depth option at the receiver position. Johnson was targeted three times in Thursday's 15-13 preseason loss to the Redskins, catching two passes for 22 yards. Analysis: Johnson took a step back in Week 2 of preseason after recording 45 yards and a touchdown in the first exhibition match. He'll need to ramp things back up next week if he wants to make the roster. Johnson caught three of five targets for 45 yards and a touchdown during Friday's 17-0 win over Atlanta in the preseason opener. Analysis: Johnson is right around the roster bubble in New York, but he certainly helped his case with this performance. Former Vikings teammate Teddy Bridgewater hooked up with Johnson for a 23-yard gain late in first quarter, and the receiver made an even bigger play late in the second quarter when he caught a 14-yard touchdown pass thrown by Sam Darnold. Johnson actually caught the ball in the end zone on the previous play as well, but that one was called back due to offensive pass interference. Johnson (knee) is participating in training camp, Brian Costello of the New York Post reports. Analysis: Johnson is showing no signs of the knee injury that forced him to spend the entire 2017 season on the Panthers' injured reserve. The wideout is facing an uphill climb to earning a roster spot within a crowded Jets receiving corps. Johnson (knee) signed with the Jets on Monday, Brian Costello of the New York Post reports. Minnesota Vikings quarterback Teddy Bridgewater showed quite the heroics in the teams 30-24 win over the New York Jets with a game-winning 87-yard touchdown pass as he finished with 309 passing yards and two touchdowns. 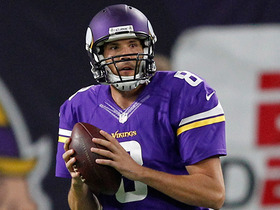 Minnesota Vikings quarterback Sam Bradford finds wide receiver Charles Johnson for 17 yards. Minnesota Vikings QB Sam Bradford strikes a pass to wide receiver Charles Johnson for 25 yards. 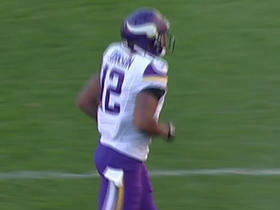 Minnesota Vikings QB Sam Bradford strikes it to wide receiver Charles Johnson for 40 yards. 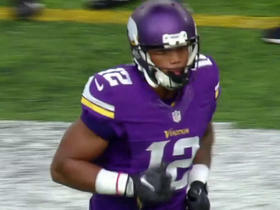 Minnesota Vikings QB Sam Bradford finds wide receiver Charles Johnson deep for 30 yards. 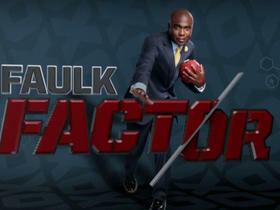 NFL Media's Marshall Faulk takes a look at two impactful plays from Week 8 that were crucial to their team's win. 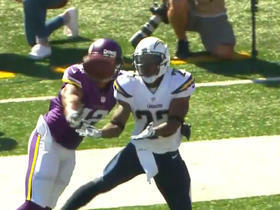 Chargers Steve Williams with the interception. The "NFL Fantasy Live" crew discusses what players from the Minnesota Vikings are worth drafting in fantasy football and what rounds to get them. 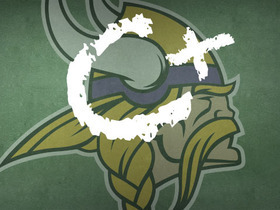 Colleen Wolfe and Elliot Harrison break down the final report card grade for the Minnesota Vikings.